A massive fire has erupted near a NATO base within the Buca district in Izmir, western Turkey, local media report. NATO spokesperson Oana Lungescu has denied the reports of a fire "in or near" territories hosting NATO facilities in Turkey, adding that its HQ "is fully operational."
. @ATA_Macedonia pls check your sources. No fire took place in the #NATO HQ in Izmir or in areas next to it. Our HQ is fully operational. 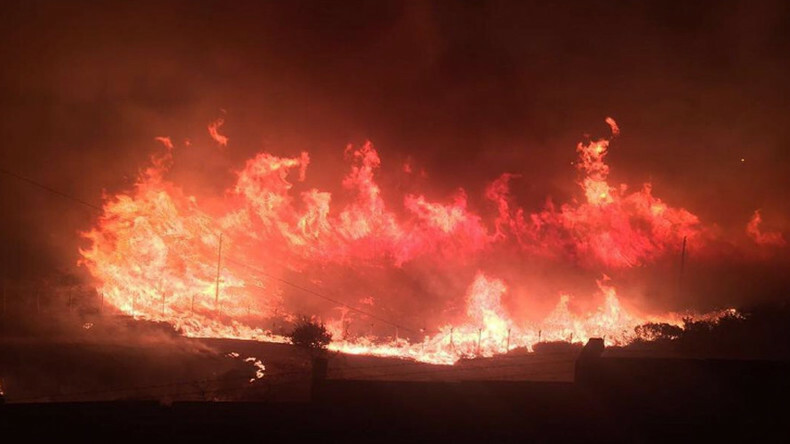 However, according to local media reports and images and videos posted on social media, the inferno started on Sunday evening on the border of the Sahintepe and Mevkiinde districts. The fire engulfed the grassy wooded area and is spreading closer to NATO’s military base because of strong winds. According to CNN Turk, the fire is threatening a number of populated areas, and has already impacted a home for the elderly and its adjacent garden. Despite intense efforts by NATO-stationed troops to stop the fire, the rapidly-spreading flames are moving closer to the arsenal, T24 News reports. The channel also reports that possible “sabotage” is suspected. The fire is threatening the Allied Land Command (LANDCOM) base at Şirinyer (Buca) in İzmir, Turkey. LANDCOM is charged with improving the effectiveness and reaction time of the alliance’s land forces that when needed could respond to an international crisis. Under the NATO nuclear weapons sharing program, Washington maintains its largest overseas nuclear arsenal in Turkey, consisting of up to 50 nuclear weapons, according to some estimates. The nukes however are stored at the base at Incirlik, and none are reportedly stored in Izmir. It took more than seven hours of battling the flames using helicopters and an airplane to contain the blaze. However, it has not yet been fully subdued, several local papers announced.